"Field Recoding (note lack of “r” in “co()ding”) is a process I utilize to resituate field recordings into new surroundings. Most often utilizing my own field recordings with my modular synthesizer. Often, the first step in Recoding is re-recording the source Field Recording inside my studio space. I approach these recording sessions just as I would my standard outside field recording sessions, meaning that the environment and sounds within it are very deliberately chosen and engaged with. In the case of this piece, I played the original .wav file directly from the Dropbox folder on my iPhone 7+ which was sat within a Tibetan Singing Bowl. 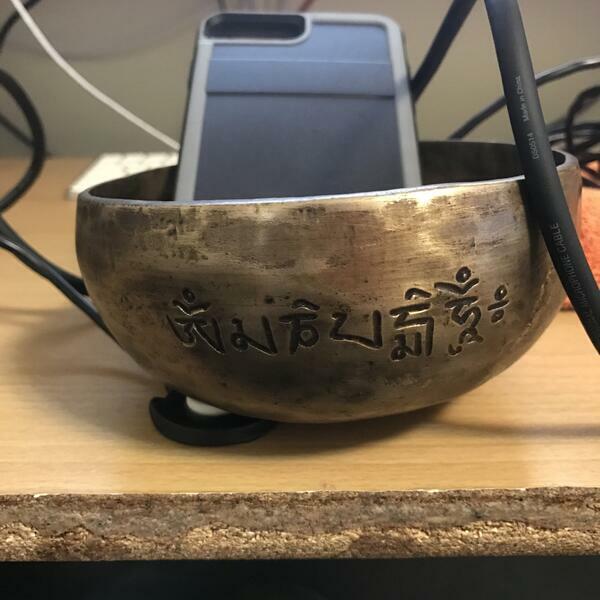 The singing bowl’s resonance, excited by the iPhone’s speakers, was captured by a contact microphone attached to the outside of the bowl. The low drone heard in the left channel at the start of the piece is the sound of a large tractor clearing debris in the park a block from my home. Its rumbling travelled through the ground, up the walls of my home, and vibrated the desk that the bowl and phone sat on. At approximately the 1:18 moment of the piece, I turn on my own vacuum which was recorded to the right side of the sound field utilizing a coil pick-up attached to the exterior of the vacuum, revealing the inner workings of the electromagnetic field running through it. The contact mic picked up a bit of the ambient sound of my vacuum as well. At approximately 3:33 of the piece, I turn off my vacuum and allow the original recording to play out. Finally, we return to the low drone provided by the tractor. The title of the piece is a play on Jeff Koon’s “New Hoover Convertibles (1981)” (see attached image). I’m always awed by the sheer dimensions of places like Southwell Minster. The sense of literal space is overwhelming on a cosmic level. I like the no-nonsense idea of somebody vacuuming such a space. Moving the air (dare I say “Spirit”) in a very honest way. My piece attempts to bridge the space between my sacred space and another. I situated the Recoding within the bowl, a sacred object which is precious to me. In Koons work, he’s elevated something which could be seen as “lowly” to a new, higher station. A redemption of sorts."